Home > Business > "Committed to Recycle"
Nestle Malta, who are displaying the seal on their advertising posters. "Nestle Malta felt it in its obligations to ensure that it takes responsibility for the recycling of all waste placed by the company on the local market" says Mr. Giorgio Mondov, Nestle Malta Managing Director. The Belgian BeerShop who are displaying the seal on their stationery. "Malta needs a culture shift to keep the islands of Malta as clean and pollution free as possible" says Mr. Ted Whitfield, proprietor of The Belgian Beer Shop. 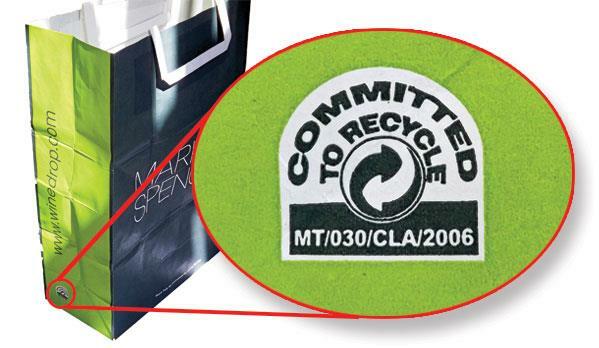 Marks & Spencer are displaying the seal on their shopping carrier bags. "At Marks and Spencer, we are restless in our aim to be sustainable in our ways of working and across all of our supply chains. In line with Plan A principles we continuously strive to counteract any harmful effects our operation may have on the environment, every day, everywhere." Apart from the environmental point of view, in today's increasingly competitive market, displaying the GreenPak "Committed to Recycle"seal makes good business sense.